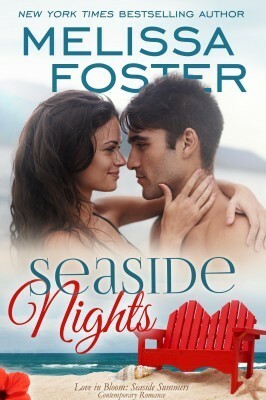 Fall in love with Sky Lacroux and Sawyer Bass in Seaside Nights, the fifth book in the Seaside Summers series by New York Times bestselling author Melissa Foster! Sky Lacroux has finally realized her dream and opened her own tattoo shop in Provincetown, Massachusetts. She's happy as can be, preparing the shop for its grand opening and renting a cottage in the Seaside community while renovations to her new apartment are being completed. The only thing missing is the one thing she longs for, and has no control over—love. Sawyer Bass, a professional boxer, plays his guitar at a local bar to escape the painful reality of his father's deteriorating health and a recent health warning of his own. But when he spots a stunning brunette across the room, escaping reality goes out the window, and the beautiful woman becomes the focus of his next song—and maybe even the rest of his life. Now it’s like looking in a mirror, at what could happen to me if I get hit in the head again. Now I hear his slowed voice telling me to give it up and follow my heart to something else. Now I’m standing between two rivals playing Russian roulette. On one side is my father’s care and quality of life. On the other is something I haven’t thought about with any great significance— my own well-being. She looked out the front window and saw Sawyer heading down the alley toward the parking lot. His shoulders were strikingly broad, his waist narrow. Every step was determined, unlike those walking casually on the main road. What do you think? Would you want to read more? I'll have to try one of her books at some point! I am yet to come across a book by this author that I did not enjoy. I have been wanting to read this book. Your teaser just makes me want to read it more. Nice teaser, sounds like a book I'd enjoy. It is a beautiful and heartwarming story.